We’d love your help. Let us know what’s wrong with this preview of Invasion by L.A. Graf. Millenia ago, an apocalyptic battle was fought in the Alpha Quadrant. The losers were banished, but what became of the victors? The Federation is threatened by this ancient mystery when a battered and broken version of the Defiant is found, frozen for five thousand years, in an icy cloud of cometary debris. Captain Sisko and the crew of Deep Space NineTM are summoned to answer the most baffling question of their lives: how and when will their ship be catapulted back through time to its destruction? And does its ancient death mean that one of the combatants in a primordial battle is poised now to storm the Alpha Quadrant? Only the wormhole holds the answer -- and the future of the Federation itself may depend on the secrets it conceals. To ask other readers questions about Invasion, please sign up. The Furies' invasion takes a twist! This is the third book in a series of four, featuring the Star Trek "Invasion!" event. ...but something happened and they The Furies' invasion takes a twist! ...but something happened and they were expellled into other dimension. ...the frozen remnants of the USS Defiant with more than five thousand years of antiquity!!! This sole discovery is quite stressful to look at, but things got worse when it seems to be connected with the powerful Furies that have been determined to invade the Federation twice! While, Captain Picard is facing the second wave of the Furies, it's up to Sisko to learn about the very roots of the Furies' original reign. I recall never really enjoying any of the crossover series Pocketbooks attempted, so I was surprised by how much I enjoyed this installation of the *Invasion! * series. I suspect part of the reason is that for the DS9 book, they (editor, writers, planners, whomever) took the idea at the heart of the series--this invading, unstoppable, ancient species looking to reclaim its territory that now makes up a big part of the Federation--and turns it on its head by having the DS9 folks have to deal with I recall never really enjoying any of the crossover series Pocketbooks attempted, so I was surprised by how much I enjoyed this installation of the *Invasion! * series. I suspect part of the reason is that for the DS9 book, they (editor, writers, planners, whomever) took the idea at the heart of the series--this invading, unstoppable, ancient species looking to reclaim its territory that now makes up a big part of the Federation--and turns it on its head by having the DS9 folks have to deal with said unstoppable, ancients species' archenemy (or something like that). In a way, that's why I enjoyed DS9--it took the Trek concept and sort of turned it on its head and made it its own thing (which is why I strongly suspect I'm not so much a Trek fan as I am a DS9 fan). I also appreciated that the writers had a much stronger grasp of the world of which they were writing than other writers of DS9 books: It's obvious they'd watched more than "Emissary" before getting to work. They display a strong understanding of the conceptual layout of the station and the space around it. It seems almost cliche to expect that the DS9 entry in a story-arc would feature the most depth, the best characterization, and push the limits of epicness. "Time's Enemy" does this in spades, by taking a fresh approach to the "Invasion" story arc and adding some mind-bending timey-wimey terror to the mix. Utterly superb storytelling. This is by far the best novel of the invasion series! L.A Graf delivers a fantastic, dynamic plot line that keeps you turning pages. Love the temporal aspects of it, as well as the command of the characters. It should have been made into a series episode it was so good. A must, must read! Time's Enemy might well be the best Star Dreck novel ever written. Even better than my favorite, Chain of Attack. A starship, nearly torn to pieces, is found hidden in a comet. After study, Starfleet finds it to be an alternate version of the Defiant...nearly five thousand years old. The Deep Space Nine crew (most of them) are brought in to solve the mystery of how their ship was thrown into the distant past and wrecked in battle. 8/27/2011: Have now read #2 as well. This one still really does better as a stand-alone. The connection to #2 is not very strong. 11/14/2009: Book 3 of 4; I have not read the others, but this one works well as a stand-alone. I was torn on how to rate this. If I were to look at the book on its own and judge its merits, I might rate it higher. The story is pretty entertaining and for as often as Trek likes to play with time travel I thought this tale was clever and nicely done. I haven’t read any DS9 books before and this could make me read more - as good a compliment as I think a book like this can ask for. All this aside however, looking at this as the third of a four part series I didn’t feel like it really held up I was torn on how to rate this. If I were to look at the book on its own and judge its merits, I might rate it higher. The story is pretty entertaining and for as often as Trek likes to play with time travel I thought this tale was clever and nicely done. I haven’t read any DS9 books before and this could make me read more - as good a compliment as I think a book like this can ask for. All this aside however, looking at this as the third of a four part series I didn’t feel like it really held up the larger narrative. The Furies are rarely present, save for some passing mention here and there. There is some interesting historical information on the Furies that shed some light on their story but it all just felt like Easter eggs, not an important part of the plot. I think there was a good opportunity here for this story to run alongside Soldiers of Fear, the TNG installment in this series. This could have interacted with events, leading a different perspective and making it feel like a larger piece of the overall journey. While the first half of the book was not able to amaze me (some inconsistences, confusing storylines that I felt were forced so that the story would conclude the way it did), the second half did a good job to boost my rating to 4 stars. While I still think the first book of this series was the best, this one started to reveal the Furies mystery in a way that was still entertaining (even though this was a third book about them) and I am looking forward to how this all ends. What was the point of this book? Its an alright, I’d rate it a bit higher but it feels extremely shoehorned into the “Invasion!” series. The story felt like it came to its natural conclusion at the end of book 2. The revelation at the end doesn’t feel worth the time spent on it, maybe it would have been better if they cut it in haft and paired it with whatever comes in “The Final Fury”. Hopefully there’ll be a bigger pay off next book! A friend gave me this to read. I never could get into ds9 and he said this would help. It didn’t. I don’t like ds9. I find the characters boring and the thought of the space station and the wormhole just never interested me. My critique is more of the series than this book. That’s probably why I couldn’t get into it because I don’t really know the characters. I have read my fair share of Star Trek books, some have been great like Star Trek: Prime Directive and some have been horrible like Warped, but its been a long time since I read a book that conveyed such an incredible connection to the show. L.A. Graf, who has written four Star Trek books in all, proves that he is not just a hired gun to push out a book but a fan of the show as well. Graf, through his writing provides a deep and rich environment for the characters to flourish. The story itself i I have read my fair share of Star Trek books, some have been great like Star Trek: Prime Directive and some have been horrible like Warped, but its been a long time since I read a book that conveyed such an incredible connection to the show. L.A. Graf, who has written four Star Trek books in all, proves that he is not just a hired gun to push out a book but a fan of the show as well. Graf, through his writing provides a deep and rich environment for the characters to flourish. The story itself is very deep and very well written. There can be no doubt that Graf studied every detail of the characters and their lives before undertaking such a task. In the book Graf paints us a picture of coming war. He begins by bringing the DS9 crew of Sisko, Dax and Julian to Starbase One to meet with a high ranking Admiral that has stunning news to reveal to the three. Found is a copy of the Federation Battleship, USS Defiant in an icy cavern. After it is deemed to be thee actual Defiant the three are ordered to find the enemy that has pushed the defiant five-thousand years back in time. Returning to the station aboard a science ship captained by a Vulcan, Sisko must chase after the Sreba after it enters the wormhole against orders. After chasing the Sreba into the Gamma quadrant, Sisko and the crew of the Defiant find her destroyed by an enemy they have never encountered before and by means unknown. Following a couple of Jem'Hadar ships to a local space station they are confronted by the enemy and engage them in battle. If Sisko can't stop the enemy then the future of the wormhole and of the Alpha quadrant itself is in risk. Back on the station Kira is tasked with stopping an old Bajoran resistance group from destroying the station after they too come in contact with the unknown enemy. Her and Odo are forced to fight off the resistance cell and the new enemy as well. Some come out unscathed but others are deeply effected and horribly injured by the confrontations. Those who know the show well may wonder where this book falls into the DS9 timeline, but this book is considered non-canon as it has no effect on the actual show. But if you are wondering I would put the book somewhere after the Jem'Hadar war. Some of us who are familiar with the show called Stargate SG-1 already know that both that show and DS9 have borrowed from each other over time. Some fans of SG1 will see quite a few similarities between this book and that show, but I'm not sure which came first. The enemy is both familiar in name and characteristics and those who enjoyed the Replicators and the joke of the Furlings in SG-1 will have fun with this book too. L.A. Graf has done an amazing job with this book. If you are a fan of the show then this is a must read for you. I look forward to reading the other Invasion books and L.A. Grafs other books as well. If his others are as good as this one then count me in. This is book three of the four-part crossover series "Invasion!" L.A. Graf (Let's All Get Rich And Famous) is the pseudonym for a team of Star Trek writers. It was not a surprise to me, to find that this is the pivotal and expository novel in the overall arc of the crossover series - probably the one around which the other novels were This is book three of the four-part crossover series "Invasion!" L.A. Graf (Let's All Get Rich And Famous) is the pseudonym for a team of Star Trek writers. It was not a surprise to me, to find that this is the pivotal and expository novel in the overall arc of the crossover series - probably the one around which the other novels were written. The sophistication of each of the books corresponds roughly to that of the four television series on which it is based. DS9 always had a somewhat more multidimensional band of characters and array of cultures, and that is true in this novel as well. The phrase that comes to mind when I read this book was "word density". Long, aimless sentences pour into rambling paragraphs that choke out any joy of language that might have been found here. Luckily there are some saving graces. The story, without any spoilers, is hard to explain. Suffice it to say Starfleet finds a 5,000 year old artifact they think Sisko will be very interested in seeing. There is some clues left behind that make them believe the mysterious Furies are involved. The big plus o The phrase that comes to mind when I read this book was "word density". Long, aimless sentences pour into rambling paragraphs that choke out any joy of language that might have been found here. Luckily there are some saving graces. The big plus of this story that keeps it from dropping to two-stars is the Bashir/Dax moments. Forget Jadzia. Forget Ezri. The real love story is Bashir and the worm. I loved that idea! Many of the Deep Space Nine books feel like they were abandoned novellas retooled into a Star Trek shape. This one feels like a regular Deep Space Nine novel retooled to fit into the Invasion! sub series. The result is an extra 50 pages and that familiar tacked on feeling. I don't want to give the plot away, but if you read the first two books in the series and expect to see more of the nightmarish Furies you will be disappointed. Overall, it wasn't bad, but it was...dense. Since I enjoyed the first two books in the mini-series I might have had too high of expectations for this book since DS9 is my favorite of the Trek series. Page 107 a few lines down it reads "Pak Dorren resistance cell raided an ancient plutonium mine"
You don't mine. Weapons grade plutonium! It is man made. This is a really big mistake in this book! I don't think I am going to finish this book. You just can't sit down and write Trek and not understand basic high school science. Trace amounts of plutonium can be found in nature. But that stuff is too scarce and too weak to be used for anything. You have to have a dedicated reac Page 107 a few lines down it reads "Pak Dorren resistance cell raided an ancient plutonium mine"
Trace amounts of plutonium can be found in nature. But that stuff is too scarce and too weak to be used for anything. You have to have a dedicated reactor to create WG plutonium. Why does Graf not know these simple facts? You need more than just plutonium to make a WMD. And it would not surprise me that Gaf would be one of those people. Freaking. Out over the news about a guy who had a tiny chunk of hello cake uranium ore back in 05`I think, in his. Basement. Uranium ore has to be brought in by the truckload and. Put through the mill'so to speak. It takes tons of the stuff to get enough to make anything. Want something interesting to read? Ref americonium and smoke detectors...that may help put into perspective what I mean. You can't make a wmd from naturally occurring plutonium. This book is awful. Don't buy it. BAD READ. I'm not trying to be rude but this mistake is epic! I like the story itself - I love time traveling stories in general, and especially in my favourite TV shows, and this one has a nice twist. I also love how the various parties of the story try to stop the time travel and the reason for the time travel from happening. I love everything Julian does in this story. The implications that he had to live alone (save for the old Dax) for ~100 years on the destroyed Defiant with no hope for rescue because he's 5000 years in the past? *hugs him so much* And my favourite scene ever? When he protects the old Dax from the alien and then has to climp the ladder up to the Ops with his ruined hands? OMG. One of the best H/C scenes ever. I also love Kira so much in this one. Her frustration of the Bajoran Militia, not being told stuff, having to deal with Quark, being badass and wanting to go after the alien even though she's been badly hurt. Yeah, I love her. The racial characteristics were all here and neatly done, although at times the switching between station and ship was a little more confusing than it should've been. The strands, terrorists, a seemingly invincible aliens, ill Andorians and the whole Dax thing was all a little overwhelming, but then I am coming down with a horrendous cold and so am not really at my best. was fairly easy to ignore - comfort had a way of sneaking up on you and making you complacent." While I love Star Trek, I think that Star Trek novels mostly don't work for me. So, take this review with a grain of salt. There were some interesting ideas in this book, and it was pleasant to revisit characters that I love. However, there were some pivotal moments near the end where the relationship between Jadzia Dax's host and symbiont body was portrayed in a way that ran completely counter to how it worked in the actual show. It was only a few lines, but they displayed such a fundamental dif While I love Star Trek, I think that Star Trek novels mostly don't work for me. So, take this review with a grain of salt. Third in the series and I just only somewhat like the series. Like the two other books, same premise and a few surprises. I still worked through this series. The characters are again as you know them to be and expect. So if you have read the first strike & Soldiers of Fear you will enjoy this one too. The writing style does change with each author but the characters show through as you expect them. I recommend it so far. Definitely the most interesting part of the Invasion series as well as one of the best DS9 novels so far. The third part of the series-crossing quartet adds a new dimension to the Invasion storyline by concentrating not on the Furies themselves but on their ancient adversaries. Added to that, there's timetravel, lots of action, wormhole shenanigans and much more combined with great characterisations, especially a very fascinating use of the Jadzia Dax character's unique properties. A great read! The only book in the 'Invasion' storyline I read, and I must say, it stands quite well on its own. I very much enjoyed the plot and pacing of the story, which was gripping. The mystery of the ancient Defiant was fascinating. My only problem was that Odo seemed a little *too* sarcastic at times, especially toward Kira. Also, now that I think about it, Pak Doran was a little two-dimensional as well. I love DS9. I enjoyed the first two books in the Invasion! series. This installment, however, is too wordy to be enjoyable. Each scene tends to ramble on for far too long, throwing an inordinate amount of technobabble at the reader for no good reason. The worst part, at least for me, is its only tangential relationship to the main Fury/Invasion! storyline. We get that connection very late in the story, by which time I didn't even care anymore. This book was a wonderful addition to the Invasion crossover series. The action is non-stop, the characters are well-written, and the plot is interesting and engaging -- a hard book to put down! Add to that the creation of "bad guys," in their own way, that are as scary as the Borg. I loved this book. It was exactly like watching an episode, except longer and with more detail than a standard episode could deliver. All I can say is, "Read this book!" 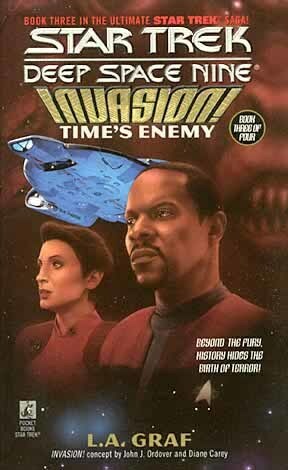 Time's Enemy is a good DS9 novel, and the author pulls off the great trick of taking a novel that is part of a four part series and letting it stand on its own. I've read more than a few of these Trek novels and this stands out as a favorite simply because the characters didn't act out of character and the story was interesting. The premise is strong and holds the reader's interest throughout the entire novel. Nel terzo romanzo, dedicato a DSN, le cose si fanno decisamente interessanti. Il romanzo è, tutto sommato, leggibile se stante e la trama è intricata ma coinvolgente, i personaggi ben caratterizzati e le idee ben sviluppate. I read this story many years ago,this is a very good story,the characters are very well developed!! !,i would give it ten stars if the rating would allow it,clearly the best in this series so far!!! L.A. Graf reportedly stands for Let's All Get Rich and Famous. Its a pseudonym used by authors Karen Rose Cercone and Julia Ecklar. They have co-written some eleven Star Trek novels. Their first Star Trek novel came out in 1990.